Food truck vendors are raising the bar: the quality, variety, and sheer number of today’s gourmet trucks have never been greater; and while a few of NYC’s best serve vegan offerings, none are 100% vegan. Adam Sobel, a self-taught chef who got his start working in one of Tom Valenti’s restaurants is on the road to changing that. 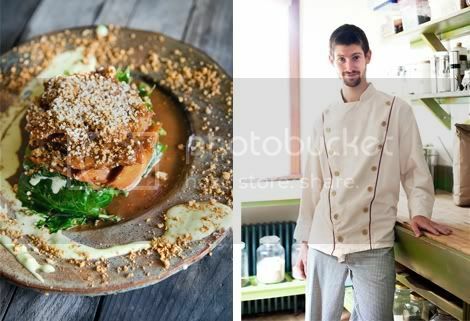 As owner of The Cinnamon Snail, the country’s first organic vegan food truck, Adam currently hits the streets of Hoboken — and hopefully soon, Brooklyn — to spread his passion for veganism and talent for cooking to vegans and non-vegans alike. Kitchen La Bohème: Why did you choose to open a specifically vegan food truck, and what message do you hope to spread with The Cinnamon Snail? Adam Sobel: I went vegan about nine years ago when my first daughter was born. My wife turned me on to veganism and generally to nonviolence when I met her. 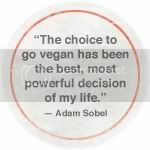 Aside from having children, the choice to go vegan has been the best, most powerful decision of my life. The truck has been a vision of mine for many years now. 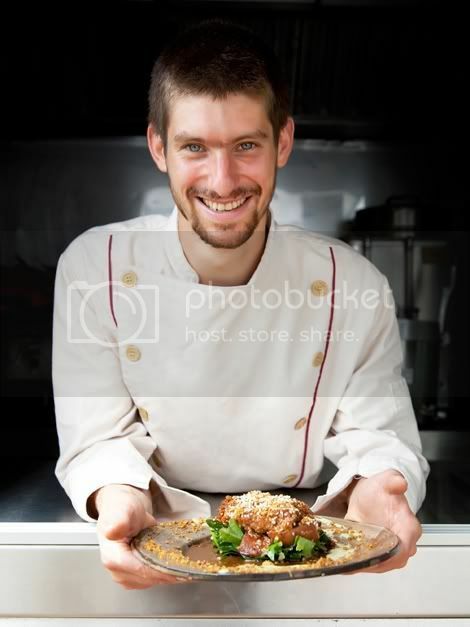 The thing about most vegetarian restaurants is that largely, you are "preaching to the choir". Most customers are already vegan, or at least conscious about the suffering of animals in food production. With the truck, I deal with the full spectrum of people. Most of my customers are not (yet) vegan. They come to my truck and see awesome looking donuts and pastries, and they fall in love with the sweet, donut-y circles of heaven. After a couple of weeks they are eating Creole Grilled Tofu sandwiches, or enjoying clean raw food for lunch. I love it. I feel totally naughty, like I get to lure people into the nonviolent lifestyle whether they want that change in their life or not! It's sort of like social graffiti, with a positive, world-changing outcome. It's an important step for our species in our evolution, and what could be more fun and gratifying than for me to be part of this transformation? KLB: What are your plans for taking The Cinnamon Snail to the streets of Brooklyn? AS: We are looking to get a permit for NYC. Here's how it goes though: in the early 80s, Business Improvement Districts (BIDs) funded by major corporate chains and big box businesses started to put pressure on the New York State legislature to change the vending laws. The plan was partially based on the misconception that street vendors compete for business with brick and mortar merchants. Of course the person who buys a 60-cent cup of coffee from a bagel cart, and the one who buys a $6.00 Chai Mocha Latte from a large coffee chain are not the same person. Even with my truck, someone who wants a relaxed place to sit down and have dinner with a date is not planning to stand in line for my food and eat on a paper plate on a park bench. The BIDs pressured the city to restrict the number of vending permits citywide. Now there are about 3300 permits for the entire 5-borough area. The permit holders can renew their permits forever. Most permit holders are retired now and make some extra income renting their permits out on the black market. That black market is now the only way to get a permit to operate on the streets of NYC. In the past, this permit cost $200 every two years. Now people rent them from $14,000 - 20,000 for a two-year period of time. The renting of vending permits is illegal, so vendors have to claim that the permit holder is their "boss", or "business partner". Middlemen facilitate permit renting by pairing permit holders and vendors, for a healthy cut. We have found that there is almost no one vending in NY who has his or her own permit. We are working closely with the Street Vendor Project to reform these laws. We are also looking for a permit of our own somehow so that we can bring The Cinnamon Snail to Brooklyn. KLB: What's the strangest order or request you've ever had at The Cinnamon Snail? AS: I was invited to take part in co-ed vegan pudding wrestling. KLB: And did you say yes? AS: Sadly, I wasn't available for the wrestling match. I was already booked up on that date. KLB: Which of your menu items are you most proud of? AS: Ginger Island Grilled Tofu over Coconut Mashed Yams and Greens, with Grilled Mango Salsa, Spiced Candied Pecans, and Fried Ginger. I am also really happy about our vegan donuts. We worked on them for years, and we are still tweaking and perfecting them. We do traditional ones like apple cider, and strawberry glazed (made with fresh strawberries in the glaze) but we also do decadent ones like peanut butter chocolate cheesecake donuts, and chocolate cookie glazed. I am finally at a point with donut making where I hear from people who are not vegan that they are the best donuts they have had in their life. That's really good to hear but it just makes me want to get even better at making them! KLB: What is the best advice you’ve ever been given? AS: When you have some negative perception of someone you do not know, confront them and make sure you communicate that you love them and just want peace between you. When I first got the truck running, the Hoboken Police chased me from time to time. Hoboken has some annoying parking laws that make it tough for food trucks, and when the police choose to enforce the parking laws, it makes operating very difficult. One slow Sunday morning, a Policeman came and made me move my truck. Within five minutes of finding a new spot, he was back and already getting irritated. He gave me a ticket and told me that I had better pack up for the day. It was a bummer but I started packing up. Packing up a commercial kitchen on wheels takes time, and he was back within ten minutes, really mad now that I wasn't gone yet. The officer gave me two more tickets and followed me out of town. I didn't leave town immediately though. Instead, I boxed up all of my pastries and went to the police precinct and gave them to the police to enjoy; I make a regular habit out of doing this. A couple of days went by, and I had been left with such a bad taste in my mouth about this police officer. Thinking of the advice I had been given, I decided to go to the police station to talk to him. I let the officer know that I was sorry if it seemed like I was giving him a hard time the other day. I was super friendly, and immediately I could feel the tension clear. He told me how bad he felt when he came back to the station and was enjoying the donuts I had given them. Now that officer eats lunch at my truck often. He brings new policemen with him all the time, and I know that slowly, he is getting turned on to vegan food! If you have any leads to a New York State vending permit for The Cinnamon Snail, please send your tips to kitchenlaboheme [at] gmail [dot] com. For updates on where The Cinnamon Snail is parked in Hoboken, follow Adam on Twitter or Facebook. Visit Adam online at thecinnamonsnail.com. Adam is awesome & I love story about the policeman! I love the policeman story, too. I'm so glad he shared it! Wow - Adam is truly inspiring. That story about the policeman shows what a unique person he is...most people aren't capable of turning such a negative experience into a positive one. Plus - who the heck knew about the food cart black market?! Nuts!